I’m a biscuit geek. Full on biscuit-obsessed. I couldn’t even begin to count how many biscuits I’ve made in pursuit of biscuit perfection. Thus I share that wisdom with you, such that you might jump ahead a few steps. Recently I mentioned to a friend that I had run out of cake flour, to which she replied, “There’s flour just for cakes?? What other kinds of flour are there? I only have one!” The answer is “a lot” — and that’s just starting with the wheat flours! “All purpose” flour is anything but. What’s “low” or “high” when it comes to protein content? White wheat in general is around 9-12% protein, while the hard reds are 11-15%. As far as brands of flour, White Lily “all-purpose” flour has been my go-to for biscuit making. It’s a soft red winter wheat, and the low protein and low gluten content keep biscuits from becoming too dense. White Lily is well-known among biscuit makers and can be difficult to find outside of the South, with the exception of the occasional specialty store. There was quite a stir four years ago when the White Lily mill moved from Knoxville, TN to the midwest. (The White Lily site still maintains a FAQ about the move.) White Lily fans swore it would never be the same, but until now I hadn’t tested it one-on-one against other brands. Martha White: blend of soft winter wheat and hard red winter wheat with a protein content of 10.5%. There was one variable — the White Lily I have is all-purpose, so I added 1 1/4 teaspoons of baking powder and 1/4 teaspoon of salt. The other two flours are self-rising blends. For all this experimenting, biscuits are actually pretty easy to make. There are variations, of course. I usually add a teaspoon or two of sugar. Sometimes I dust the tops with sugar, like restaurant chain The Flying Biscuit Cafe does. I’ve come to love the butter-flavored type of Crisco for biscuits, although sometimes I use butter itself or half lard. (Yes, lard! Try it!) 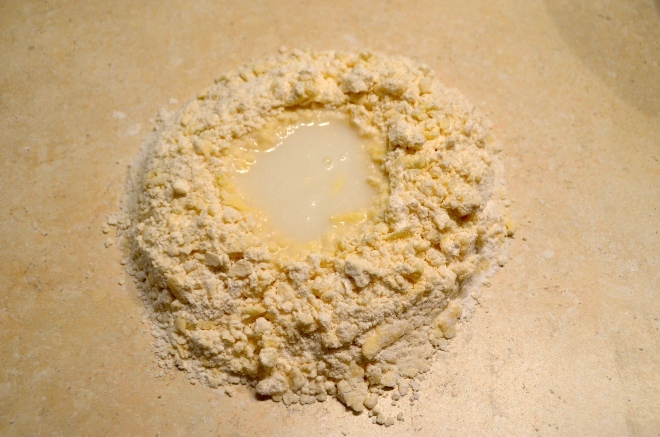 But no matter what you do, it all comes down to two simple steps: cutting fat into the flour with a pastry cutter , then working in the milk (or buttermilk if you prefer). In the pursuit of keeping gluten down, you don’t want to work that milk in any more than necessary. That’s why I always do that part by hand. Just make a well, pour in the milk, and combine only until it’s all together. Then you’re ready to cut them out–wasn’t that quick? To get layered biscuits, pat the dough down, fold it in half, and repeat a few times. Not too many, though–again, you don’t want to overwork the dough. 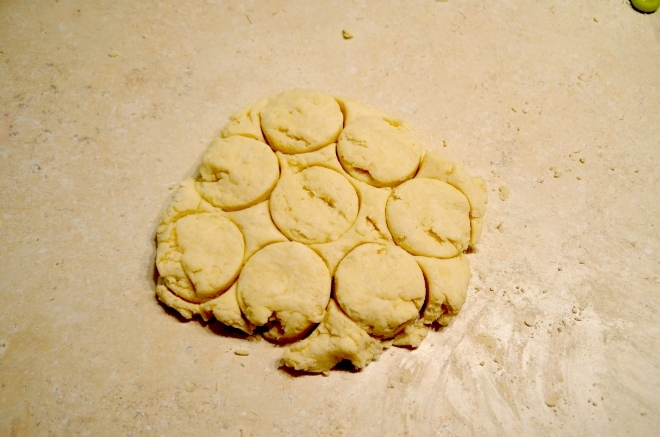 Cut the biscuits as closely together as you can so that you rework the dough less. Cut straight down. No twisting the cutter. When you lift them, put them top down on the cookie sheet. Those two things will ensure that you don’t seal the edges any more than necessary and that the most sealed edge–the side you cut from–will be at the bottom, so they will rise as much as possible. Put them closely together on an ungreased cookie sheet, even touching if you like. Biscuits don’t spread, and they feed off of one another’s heat. They like to be near each other and will rise better. From left to right below, these are White Lily, Martha White, and Southern Biscuit. As you can see, they rose and browned similarly, with the White Lily ending up slightly paler. In taste, however, White Lily lost. Having been devoted to the brand for years, that’s hard for me to say! I felt that the Southern Biscuit ones were clearly the best, and a majority of my drafted taste-testers agreed, although some preferred the Martha White. But unanimously, White Lily was in third place. That’s not to say I’d turn away a bag of White Lily — they’re still delicious, and the differences were subtle. But I won’t feel as sad next time I’m on a flour hunt and can’t find that old standby.